1Department of Molecular Epidemiology, German Institute of Human Nutrition Potsdam-Rehbruecke, Nuthetal, Germany. Can specific foods provide health benefits? Will adopting a specific food pattern prevent major chronic diseases such as type 2 diabetes, cardiovascular disease, or cancer? Are exclusion diets—vegetarian or vegan diets or avoidance of foods containing gluten, lactose, or fructose—the key to good health? Should doctors advise patients to follow a paleolithic diet? The wide range of popular diet plans and concepts seems to continuously expand.1 But to what extent are their purported benefits supported by scientific evidence? We have qualitatively assessed the available evidence from recent systematic reviews of long term studies to summarise current understanding of foods or dietary patterns and risk of major chronic diseases. Given that nutrition research has been criticised for providing apparently implausible results,23 which might contribute to the range of different popular diet concepts, we also discuss methodological approaches and specific challenges of conducting research on food intake patterns and health. Food patterns can be defined as the quantities, proportions, variety, or combination of different foods and drinks in diets, and the frequency with which they are habitually consumed.5 Given that food intake is a multi-dimensional exposure, there are obviously numerous different combinations of foods to potentially investigate. How these combinations are defined in nutrition research largely depends on the research question and study design. In intervention studies food intake is directly manipulated, but in observational studies exposure to food patterns is derived from self reported intake. Two main research methods have been used in this context.46 The first is using a priori defined indices intended to capture specific dietary patterns, such as measuring conformity to dietary guidelines. The second is using data driven (exploratory) statistical methods (predominantly cluster analysis,7 principal component and factor analysis,48 and reduced rank regression 69) to characterise major patterns of food intake. Both approaches allow ranking and quantifying adherence of study participants to these patterns, which is needed to evaluate their association with disease risk. Both approaches and the corresponding statistical methods have their own specific strengths and limitations (table 1). Several other defined food patterns have been evaluated in terms of chronic disease risk. Indices measuring adherence to the Healthy Eating Index,27 Alternative Healthy Eating Index,28 and the Dietary Approaches to Stop Hypertension trial (DASH)2930 have been associated with lower risk of cardiovascular events, cancer, and type 2 diabetes (fig 2).1931Table 3 shows the composition of these diets in comparison to the Mediterranean diet. Heterogeneity regarding the actual composition of these food scores exists between studies.19 Although these diets may be recommendable, only the Mediterranean diet has been shown both in observational studies and a randomised trial to lower disease risk. 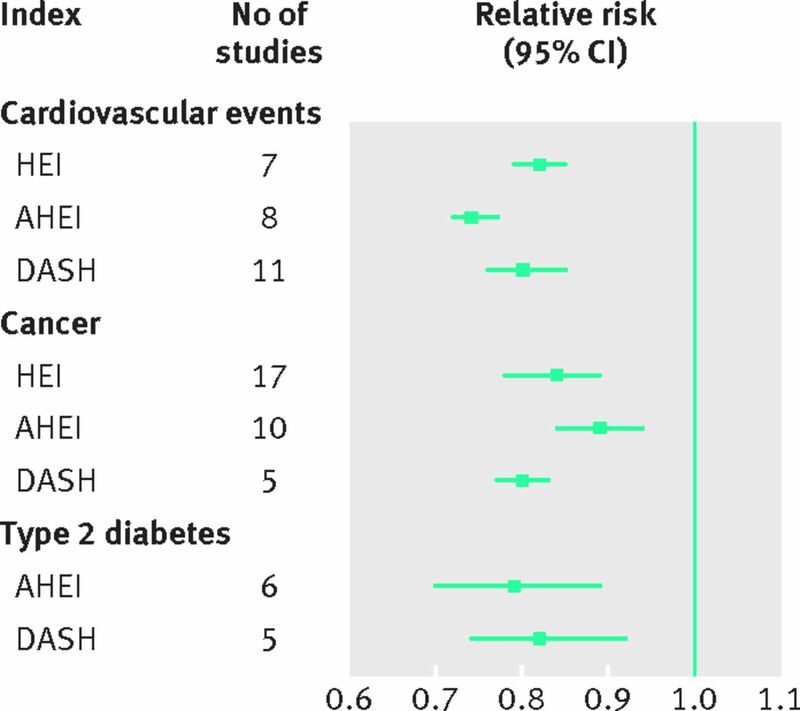 Dietary patterns and risk of cardiovascular events,31 cancer,31 and type 2 diabetes19 in meta-analyses of prospective cohort studies. AHEI=Alternative Healthy Eating Index; DASH=Dietary Approaches to Stop Hypertension; HEI=Healthy Eating Index. Evidence for the benefits of fruits, vegetables, whole grains, fish, nuts, legumes, vegetable oils, dairy, coffee, and tea—and for a lower intake of red and processed meats and sugar sweetened drinks— comes largely from observational studies, which have multiple limitations (box 1). Most prospective cohort studies use semiquantitative food frequency questionnaires. These instruments are not designed to provide an accurate estimate of absolute intake. In studies that use quantitative cut-offs to assign points for individual components of the pattern, uncertainty accumulates. Many pattern indices or scores are based on relative cut-offs, which might better reflect the semiquantitative nature of the underlying assessment instrument.4 Such approaches usually evaluate intakes relative to the average consumption level in the studied population; for example, indices to capture exposure to the Mediterranean diet usually assign points for components based on centiles of population intake.42 Similarly, pattern scores from principal component or factor analysis are based on food variables standardised to the population mean. Consequently, the average and variation in absolute intake of individual components may vary largely among populations investigated for the same dietary pattern. This is a substantial challenge for making inference on specific dose-response relations. Measurement error is a major limitation of observational nutrition studies.43 Researchers have tried to tackle the varying validity and reliability of dietary questionnaires to assess different components of a dietary pattern,44 but their results have hardly been used in investigations of dietary patterns and health outcomes. Studies evaluating the validity and reliability of dietary patterns are also scarce.4546 New biomarkers of food intake or food pattern exposure may complement or even substitute traditional dietary assessments.47 The use of repeated measurements of food intake over the follow-up period in cohort studies improves accuracy. Food patterns pre-empt potential dietary confounding by other aspects of the diet, increase the ability to assess stronger effects due to the cumulative effects of many features of the diet, and allow assessment of the interaction among synergistic components. But observed associations could be due to single components rather than the overall dietary pattern. This can be tackled by systematic analysis of the effect of single components for the overall association; for example, the reduced diabetes risk observed for the Mediterranean diet in the Europe-wide EPIC-InterAct study was partly attributable to moderate alcohol, higher olive oil, and lower meat consumption.51 The evaluation of overall dietary patterns could also mask the effects of individual foods; for example, exploratory patterns including whole grains as components showed only marginal inverse association with diabetes risk,525354555657 whereas whole grains were inversely associated.5859 Also, dietary patterns usually capture only a fraction of variation in food intake, which leaves a large space of potential effects related to foods not included as components of the pattern. Exploratory patterns are specific to the population investigated, so the contribution of single study findings to evidence based recommendations is limited. Although exploratory food patterns might have similar components, clear criteria for their consistency needed to summarise observations in meta-analysis are lacking. Replicating study findings in other populations is important, as has been applied in studies using reduced rank regression.60 A common element of exploratory pattern methods is that investigators must make arbitrary decisions when, for example, selecting the appropriate number of patterns to investigate further (table 1). Observational studies are more prone to confounding bias than randomised controlled trials. Confounding is not only related to other lifestyle factors and general risk factors, but to additional food exposures. Food intake is characterised by combinations and substitutions, so appropriate control of correlated foods is essential in studies investigating individual foods as potential risk factors. Cohort studies provide the possibility to model specific isocaloric food substitutions—an underused approach. When evaluating reductions in red meat intake, for example, taking into account the substitution of other protein sources can be informative.61 Pattern analysis might account for intercorrelations among foods. Inferences from observational studies are usually based on comparisons between different groups that differ in baseline intake; for example, comparing study participants who consume sugar sweetened drinks daily with those who consume them less frequently. Cohort studies can, however, evaluate changes in food consumption if repeated measures of intake are available. Increasing diet quality, assessed as adherence to the Alternative Healthy Eating Index, DASH, or Mediterranean diets, has been found to decrease mortality risk compared with unchanged adherence.62 Observational designs that use repeated measurements to assess changes in food patterns can almost simulate interventional trials and provide strong evidence on causality if relevant confounders are controlled. One challenge is the difficulty of identifying an appropriate control when evaluating foods or food patterns.64 If control participants do not receive a placebo or a comparative intervention, there is strong potential for expectation bias (expected benefit in the intervention group versus expected lack of benefit in the control group). The Women’s Health Initiative Dietary Modification Trial, for example, compared a low fat intervention group with intensive behaviour modification counselling to increase fruit, vegetable, and grain consumption with a “usual diet” group receiving diet related education materials only.65 Although active controls can be designed, such trials are difficult to blind. Studies depending on dietary advice may not result in sufficiently large differences in food consumption between intervention and control groups due to suboptimal compliance of participants—this critique has been raised for large randomised dietary trials, such as the PREDIMED study66 and the Women’s Health Initiative Dietary Modification Trial.67 For large trials with thousands of participants, changing people’s habitual dietary patterns demands an unparalleled workload. In addition, the high costs of running long term intervention studies makes it unlikely that associations for multiple foods, food substitutions, and food patterns can be tested for hard outcome endpoints. Still, randomised controlled trials can support or refute observations using surrogate markers of disease. The DASH trial, for example, was a controlled feeding trial with a dietary pattern rich in fruits, vegetables, and low fat dairy products, which reduced blood pressure.29 This could be extrapolated to a reduction in cardiovascular event risk, although no randomised trial has been conducted to evaluate if the DASH diet affects incidence of cardiovascular disease. Surrogate (intermediate) markers such as blood pressure can be important mediating factors between food intake, food pattern, and disease risk. Shorter term randomised trials are not only a tool to support (or refute) the biological causality of observations but can also be used to determine potential effect sizes. But the triangulation of evidence from different sources63 might be difficult owing to the different timing and duration of exposures in long term cohort studies versus short term randomised controlled trials of intermediate endpoints, as well as the choice of diet sensitive surrogate markers.68 Still, this approach is useful for the popular diet concepts for which evidence on their long term relevance for chronic disease prevention is currently lacking. Contributors and sources: The author group spans a wide range of expertise from nutritional epidemiology and public health, all of whom have contributed to past dialogue on foods, dietary patterns, and health. Sources of information for this article included published systematic reviews on foods, dietary patterns, and major chronic diseases (coronary heart disease, stroke, type 2 diabetes, and cancer). All authors contributed to drafting this manuscript, with MBS taking a lead role. All authors gave intellectual input to improve the manuscript and have read and approved the final version. MBS is the guarantor. Competing interests: We have read and understood BMJ policy on declaration of interests and declare the following: MBS receives funding from the German Federal Ministry of Education and Research (FKZ: 01EA1408A-G). MAM-G has no conflict of interest and has received funding from public agencies, including the European Research Council (Advanced Research Grant, #340918) and from Instituto de Salud Carlos III, CIBEROBN. TTF has nothing to declare. AHL receives funding from the US National Institutes of Health, US Department of Agriculture and the Hass Avocado Board. NGF receives funding from the Medical Research Council Epidemiology Unit (MC_UU_12015/5). She is a member (unpaid) of the Joint SACN/NHS-England/Diabetes-UK Working Group to review the evidence on lower carbohydrate diets compared with current government advice for adults with type 2 diabetes and is a member (unpaid) of ILSI-Europe Qualitative Fat Intake Task Force Expert Group on update on health effects of different saturated fats. This article is one of a series commissioned by The BMJ. Open access fees for the series were funded by Swiss Re, which had no input into the commissioning or peer review of the articles. US News. Best diets. http://health.usnews.com/best-diet. United States Department of Agriculture. A series of systematic reviews on the relationship between dietary patterns and health outcomes, 2014. https://www.cnpp.usda.gov/nutrition-evidence-library-dietary-patterns-systematic-review-project.
. Evaluating dietary patterns: the role of reduced rank regression. Curr Opin Clin Nutr Metab Care2016;19:341-6. World Cancer Research Fund, American Institute for Cancer Research. Diet, nutrition, physical activity and cancer: a global perspective. Continuous Update Project Expert Report 2018. https://www.wcrf.org/dietandcancer.